Our pre-mixed paints are the preference for world renowned reborning professionals like Sheila Michaels. Use paints that don't make your baby look orange! 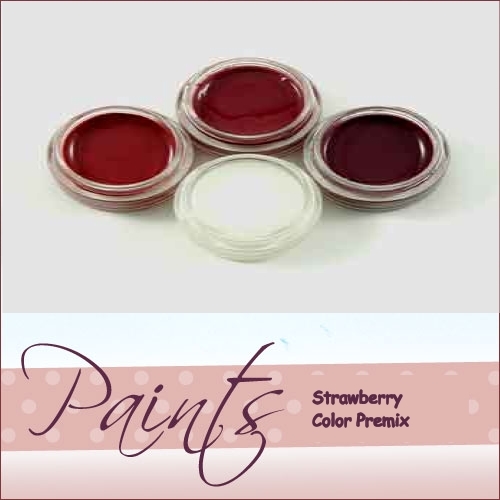 Strawberry Complexion comes with three jars: Lips, Blush, and Crease & Wrinkle paint and Clear Coat Matte Sealer. All are premixed to perfection just for you. Scroll down for information on applying the paints. You can apply the lip paint and crease & wrinkle paint without any thinner at all - or only using a tiny bit! Just use a tiny bit of paint and spread it as thin as you can to get the most lifelike translucent look. 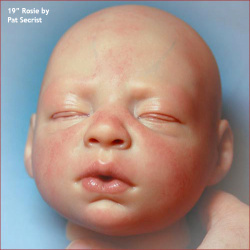 Make each baby more realistic by using our perfectly proportioned pre-mixed paints. The strawberry complexion set is pinker than the peaches and cream complexion set. Babies all have different skin tones, so we have different options for you! If using these paints with our training DVDs please keep in mind that these paints do not need to be mixed - they are pre-mixed.